Following the Second World War Minerva could not contemplate producing a brand new car and so, following their experience of building under licence, the Standard Motor Company were approached and the Vanguard was soon being assembled in Belgium. 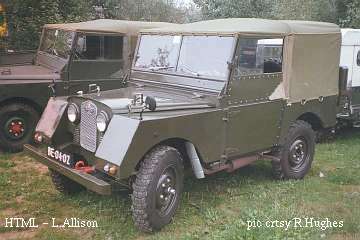 Aware of the Belgium army's search for a new lightweight 4×4 vehicle, the head of Minerva, Monsieur Van Roggen, approached the Rover company in the Spring of 1951. On the 21st June the Rover company learned that a total of 2500 vehicles would be required and that Rover were competing with Willys for the contract. In October 1951 the deal was agreed, documentation being finalised on the 7th May 1952. Under this deal it was agreed that Rover would supply full technical assistance to Minerva who would be granted permission to manufacture Land-Rovers under licence. Rover would supply Completely Knocked Down kits (with CKD chassis numbers) consisting of the chassis, engine, axle, transmission and other parts to the Minerva company in Antwerp who would then build its own steel body to suit the Belgium army. The Minerva sales literature states that 63% of the parts used in the vehicles were of Belgium origin. The chassis were later built in Belgium as they are different in a number of ways to the Land-Rover chassis, being box welded and lacking the PTO hole provision in the rear cross member. It is also possible that Rover supplied complete pre-assembled vehicles around this time; perhaps the civilian models which had rear PTO holes. The Minerva assembly line employed about 500 qualified workers who could produce 50 vehicles a day. These vehicles produced were left hand drive, 80" wheelbase models, with the 2-litre engine. The most obvious differences between the Minerva and our own Series Ones being that the front wings that are squared off and sloping (simpler to produce than Solihull's rounded front wings). The bodywork, including the doors, was all steel and a narrower front grille was used with the Minerva badge. Two styles of badges were used, the earlier version stating "Licence Rover" and the later having the oval Land-Rover badge at the bottom of the Minerva name. Slatted oval panels on either side of the grille cover the apertures and the front bumper was fitted with a single "pigtail" towing eye on the drivers side. The side lights were located at the bottom of the wings and the headlights were larger than usual. Smaller brake lights were fitted to the rear panels. Other differences include the exhaust being emitted from beneath the drivers door and the door handles. The 80" army Minerva door handles were like those of its British counterpart with the canvas flap - although the door locks are slightly different. However, the civilian Minervas had external door handles. The military vehicles look quite different from the rear; a three quarter height fixed tailgate being fitted, the police and military versions had the spare wheel mounted on the right and a jerry can holder mounted on the left hand side (the Minerva petrol tanks are a little smaller than the Land-Rover equivalent). No centre seat was provided, a toolbox being fitted in its place which was about the same size as a seat base cushion. (The space under the seat which Series Ones often use as a toolbox housed one of two 6v batteries, the second being under the bonnet). It is thought that the Belgian army stockpiled the vehicles and thus effectively brand new vehicles were, until recently, still entering service. They simply had the milage of occasional trips around the warehouse which prevented them from seizing up! An armoured / assault vehicle version was also produced (see LRO August 1988 for pictures), with heavy plating, armoured glass screens and machine gun mounts at both the front and back. The spare wheel for these was mounted on the front, in front of the grille. Field ambulance versions were produced, being basically the same as the standard vehicle but with the tilt extended at the rear to cover the overhanging stretchers. It is thought that this tilt could in fact be the same as used by the ambulance version of the Jeep. These vehicles were fitted with frames that extended when required in order to allow stretchers to overhang the vehicles body. On the 1st October 1953 a civilian version of the Minerva Land-Rover was announced. This new vehicle was different in a number of ways from the previously produced military versions. The new vehicle was fitted with three seats, a drop down tailgate and provision in the rear cross member for a rear PTO to be fitted. A choice of colours was also offered; green, grey or "other colours may be available". The company was so keen to enter the civilian market that it would produce virtually any colour the customer requested! The brochure for the civilian model describes a central PTO from the main gear box to drive belts and describes the vehicle being useful for any portable apparatus - including generators, welders and water pumps. Indeed, the scenes used for the Minerva literature are virtually identical to those that Land-Rover were using - with the obvious exception of slightly different vehicles. Like our own Series Ones, Minerva versions included station wagons, hard tops, truck cabs, and tilt versions; the tilt being fitted with side windows - uneconomic in the UK due to vehicle taxation requirements. These vehicles were apparently well received by construction companies and farmers but are now very rare. A Fire version is also thought to have been produced. It has been reported that in the mid fifties a 107" with Minerva wings was involved in an expedition across Africa, although the origin of this vehicle - and indeed its fate - are unknown. It is possible that Minerva Land-Rovers were distributed in the Netherlands and Luxembourg through the Armstrong Sidley network, as Minerva had certainly used this system in the past. In 1954, the new 86" version was introduced, (as in the UK replacing the 80"). This vehicle was produced for the next three years, until 1956 when all contracts between Minerva and Land-Rover were terminated. During this time, only 1,100 86" vehicles were produced, and these are now extremely rare. (see LRO Aug. 1992 for picture). It is likely that these 86" vehicles were only available as civilian models. The 86" had 3 seats and rear PTO hole. The rear agricultural plate was also fitted. These vehicles had tailgates and the external door handles as fitted to the 80" civilian vehicles. The Minerva sales literature of around 1956 illustrates the 80" vehicle but describes the wheelbase of being of 86" in the technical data! However, to contradict this theory of the 86" models being civilian only, a FFR 86" vehicle has been reported in LRO! The Minerva Company and Rover "fell out" in September 1954 when Minerva bought an action against Rover for damages for breach of contract and monies allegedly due. S. Wilks and L. Farmer met Minerva representatives in order to negotiate and settle any disputes. A deal was agreed which included the supply of 900 further vehicles at an advantageous price. (These being the 270 vehicles of 1955 and 630 of 1956). The original Belgian army order was for 2,500 vehicles although a further 3,421 were subsequently ordered. As a result, despatches for 1952 and 1953 totalled 7,859 Completely Knocked Down vehicles. However, only 200 CKD 86" vehicles were despatched during 1954 and this may well have contributed to the dispute between the two companies and agreement that all contracts would be terminated after a further 900 vehicles had been despatched. Thus, from May 1952 until the contract between the two companies was terminated at the end of June 1956, a total of 8,959 CKD vehicles were despatched from the Rover Company to SA Societe Nouvelle Minerva of Belgium. In 1956 Minerva announced the C-20 and M-20 (Civilian and Military) Tout Terrain vehicles but very few of these are believed to have been produced and the company soon experienced financial difficulties. The Minerva company finally fell into liquidation in 1958. Today the factory site is divided into industrial units, a number of which are derelict. Following Minerva's demise, Beherman Demoen became the sole importer and distributor for Land-Rover in Belgium. There is however a certain amount of mystery regarding these vehicles. Until recently there were many new Minervas stockpiled in warehouses for the Belgium army's use and Minervas of the early 50's may be seen today fitted with the latest armourments. It is also said that, when disposed of, the chassis are machine sawed to prevent further use of complete vehicles. I was also recently informed that when sold, Minervas are disposed of in batches of at least twenty. However, the price of these batches varied according to the price of scrap steel at the time! Minervas are thought to have possibly gone to Australia and a couple have been donated by the Belgium government to the Organisation of African Unity in Rwanda. (LRO December 1992).